Artificial Intelligence hasn't killed us yet. We're still at the stage where it's being super helpful. Add an artificial intelligence program to a speaker, and it becomes a smart speaker - a device that talks back to you, activated by your voice, or with an app on your phone. These assistants can read out your appointments, turn down the heat in your house, tell really bad jokes, and take full control of your music. They come packed inside some great speakers, and to help you pick the right one, we've put together a list of the best of this year. For more background information on smart speakers, see our comparison table and buying advice below the picks. What We Like: Affordable, easy to set up and use. What We Don't: Feels like a repackaged PLAY:1 speaker. We've grown sweet on the Sonos One. While we initially had some misgivings about it – specifically to do with its sound quality – we've since changed our minds. Having lived with the speaker for a few months, and experienced how effortlessly it's become part of our lives, we have no hesitation with elevating it to the number one spot. Unlike the previous titleholder – the Apple HomePod – it doesn't sacrifice usability in the name of sound quality. Good sound is important, but so is ease-of-use, and the HomePod doesn't stack up. The Sonos One may not have Google Assistant, relying on Amazon Alexa, but it's one of the best ways to incorporate a smart speaker in your life. In our opinion, it easily beats models from Amazon and Google, and is unquestionably the best smart speaker for most people. 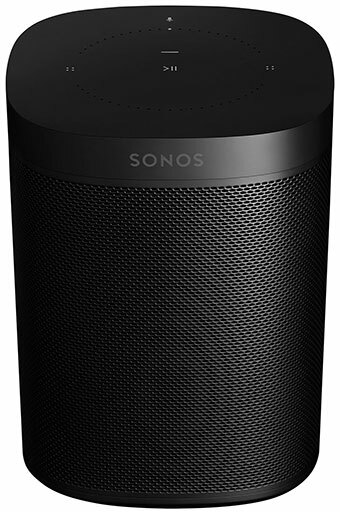 Note that this is the newest second generation model of the Sonos One, with upgraded internals designed to eventually support Apple AirPlay 2; the original retails for $20 less. What We Like: Surprisingly good sound, easy to use. What We Don't: Very little at this price. 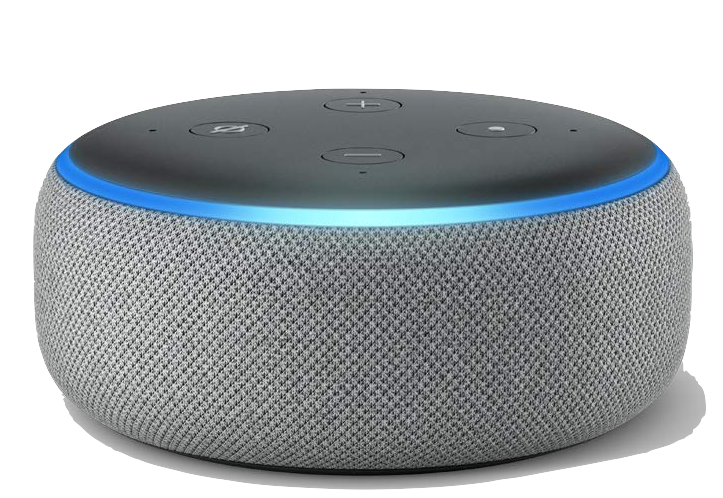 While the old Amazon Echo Dot looked like a hockey puck, the new, third generation Dot has had a makeover both inside and out. It actually looks like something we'd be proud to display. 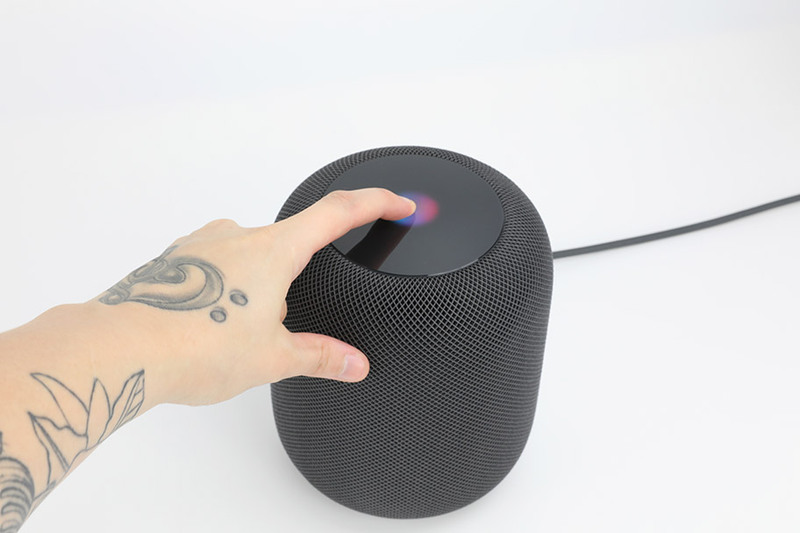 It's taken design cues from both the Apple HomePod and the Google Home Mini, with rounded sides that look terrific. Alexa definitely isn't the smartest assistant – that honor goes to Google Assistant – but it's gotten more capable over time. And the ability to add additional skills, while playing nicely with other equipment, like Samsung SmartThings, is a big plus. What We Like: Fully waterproof, excellent sound quality. What We Don't: Spotify issues, can't chain speakers. Ultimate Ears weren't satisfied with just tacking an assistant onto their existing BLAST speaker line. The MEGABLAST comes with a bunch of new tricks, including full Wi-Fi connectivity. That means it works seamlessly at home and on the road. It has a 15-hour battery life, and a rugged, waterproof design. It's rated IP67, meaning it can be submerged in three feet of water for 30 minutes and is dust-proof - you can use this speaker just about anywhere. 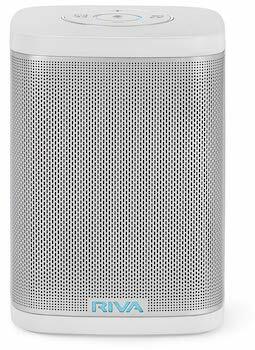 The sound is excellent, comparable to pricier speakers like the $200 JBL Link 300, below, and Amazon Alexa is integrated seamlessly. What We Like: Outstanding sound quality, superb design, can now make phone calls. What We Don't: Android users need not apply - you'll need an iPhone to make this work. When we first reviewed it, we considered the Apple HomePod the best smart speaker on the market. 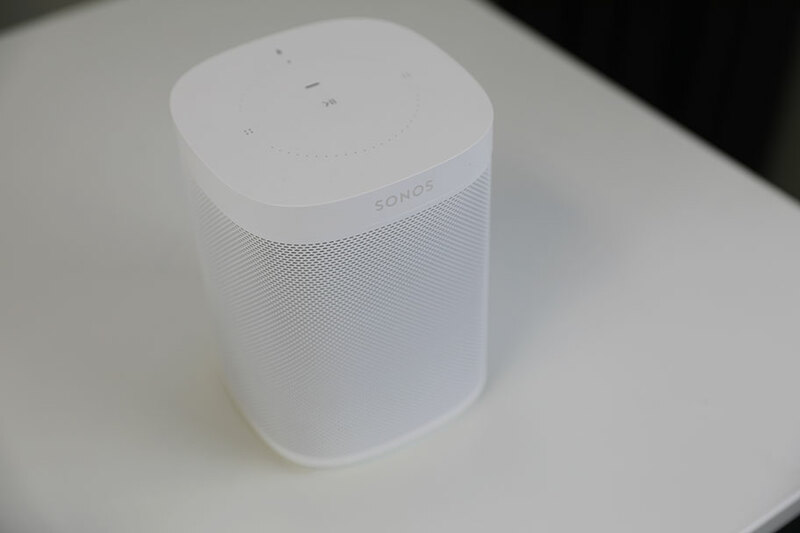 However, it simply hasn't stood the test of time, and we think the Sonos One is a better option for most people. The reason it hasn't worked out as well as we'd like is mostly the fault of Siri, Apple's virtual assistant, which isn't nearly as good as the assistants from Google and Amazon. It's also iOS only, so Android users simply won't be able to set it up, even despite its whopping $349 price tag. The HomePod hasn't sold particularly well, and it's not hard to see why. What We Like: Terrific screen, simple to use, surprisingly good sound. What We Don't: Lack of camera may be an issue for some. The Google Home Hub recently dethroned the Amazon Echo Spot as our favorite smart speaker with a screen. The glorious display does what the Echo Spot can but better: becoming an accompaniment to the voice assistant experience, without ever getting in the way. It displays information in a clean, sensible layout, and works incredibly well with the Google Assistant. For our money, we think it's the most intelligent virtual assistant there is. We were also genuinely surprised with how good the sound was. 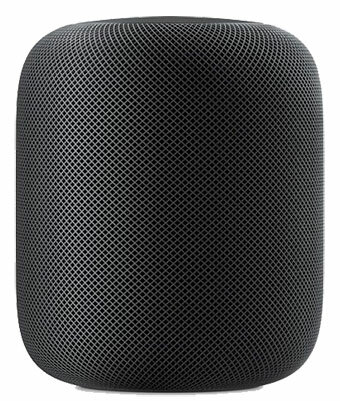 It's not going to touch the HomePod for quality, but it delivers solid detail and a relatively wide soundstage for its size. 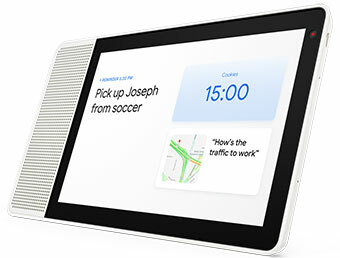 It definitely beats competing models, like the more expensive Lenovo Smart Display. And if you watch YouTube regularly, this could be the perfect companion. What We Like: Sonos multi-room capability matched with Alexa's assistance. What We Don't: Sound quality feels a little iffy. Yes, soundbars can be smart speakers too, and the Sonos Beam is the best one available - beating out the cheaper Polk Command Bar ($299) by quite some margin. It's the best because of how good Sonos are at making products easy-to-use. Setting the Beam up is a breeze, as is getting connected to other Sonos speakers you may have. It juggles both home entertainment and music duties well, capable of playing your TV audio and pushing out the Spotify playlists you like. There's no Google Assistant or Siri, but the Alexa functionality works well. What We Like: Loud as hell, great sound quality. What We Don't: Finicky touch controls, expensive for some. The Max is Google's largest speaker in the Home line, and it makes the most of it. This speaker gets crazy loud, with more volume than any other speaker on this list, including the mighty Apple HomePod. It also delivers on sound quality, with thumping bass and great mids, making it feel like an excellent speaker that just happens to offer Google Assistant. If you have a big room to fill, this should be your primary choice. It's a definite improvement on the original Google Home, below, which has middling audio capabilities. The main problem is, it's still beaten out by the HomePod in most areas. The HomePod may not have the volume, but it still sounds better, and it happens to be cheaper by $50. Obviously, the HomePod's not an option for anyone without an iPhone, but that exclusivity isn't enough to knock it off the top spot. Consider the Google Home Max a good alternative if you don't have iPhone, or if Google Assistant is your assistant of choice. What We Like: Improved sound quality. What We Don't: Design feels like a step backwards. The newest version of the Amazon Echo Plus makes some significant changes. 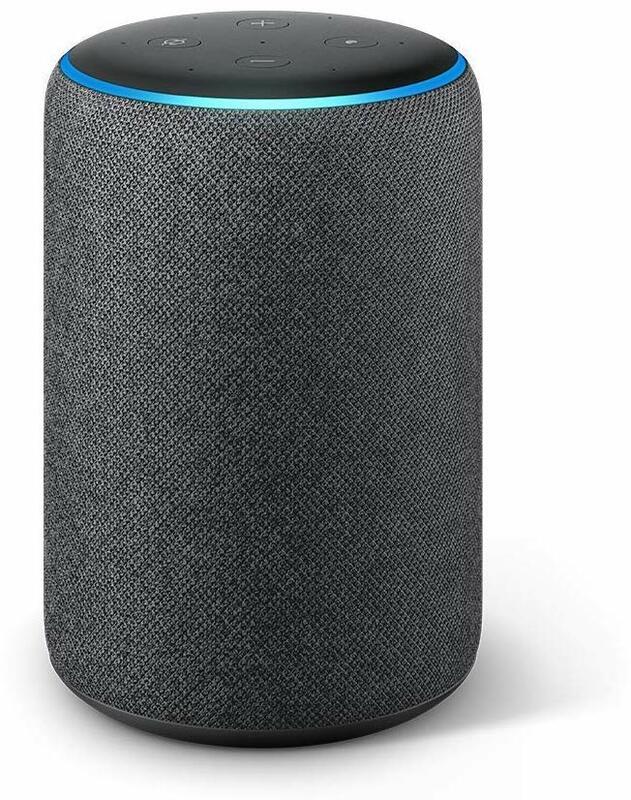 Amazon have re-skinned the Echo Plus, making it resemble Apple's HomePod. They've also ditched the volume dial, replacing it with buttons that don't feel nearly as fun or intuitive to use. We do, however, like the improved internals, which result in sound quality that far outstrips the old Echo Plus. The speaker definitely has its merits, and it's an excellent upgrade from the $50 Echo Dot (3rd Gen). But compared to the only slightly-more-expensive UE MEGABLAST, it doesn't feel like there's quite enough meat on the bones here. While we don't think these changes are enough to catapult it into the upper reaches of this list, they still result in a decent smart speaker that gets the job done. For only $25 more, the MEGABLAST offers portability, waterproofing, and improved sound quality. However, this is an excellent speaker if you're already in the Amazon ecosystem, and aren't looking for something portable. What We Like: Great sound and functionality. What We Don't: Wonky integration with other products, like Fire TV 4K. As a smart soundbar, the Polk Command Bar is good, if not fantastic. We dug the sound quality, which manages to handle both music and movies with ease. The design is slick, and in terms of functionality, the Command Bar manages to impress. We still think the Sonos Beam is the best smart bar currently available, but this is a close second. However, we have to take points off for a couple of issues. Chief among these is that the Command Bar doesn't play nice with products like Fire TV 4K; when you plug in your Fire Stick, it juts out the back, making it impossible to put the Command Bar flush against the wall. That's a pretty serious design oversight, especially given how much Polk use it as a selling point. We also aren't wild about how closely the controls resemble an Amazon Echo Dot. The original design of the Dot was pretty ugly, something that Amazon has improved in the most recent release – which also happens to be our top budget pick, above. Unfortunately, Polk are stuck with the old one, lodged in the middle of their bar. Yuck. What We Like: Built-in Chromecast, decent functionality. What We Don't: Sound can be harsh at high volumes. 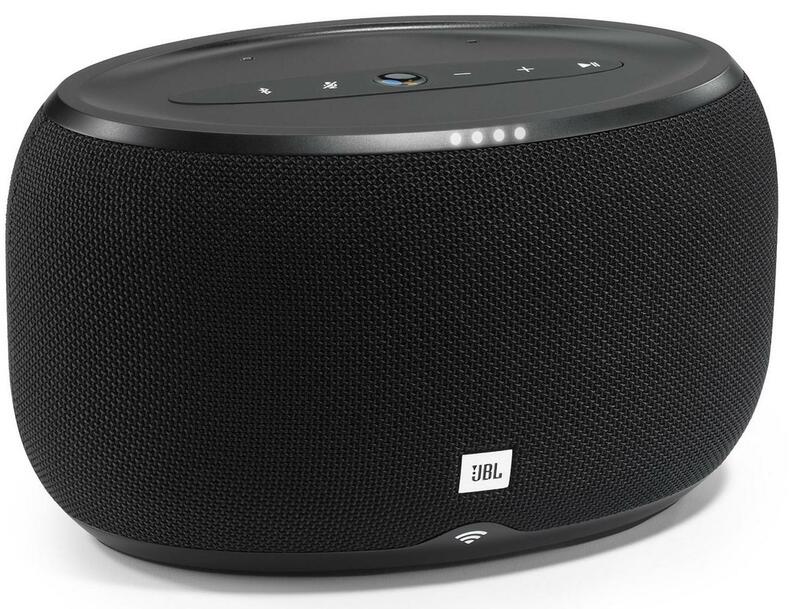 JBL make some very decent smart speakers. The Link 300 is the middle speaker in the Link line, bracketed by the $300 Link 500 and the $150 Link 20. In common with those speakers, the sound quality is good, but not spectacular – there's a definite sharpness to the treble that we found exhausting. That being said, the build quality is superb - the speaker feels weighty and substantial. It's also easy-to-use, with a quick setup and simple controls. JBL will never have the cool factor that Apple or Google have, and they certainly don't have the design know-how, but this speaker works well. 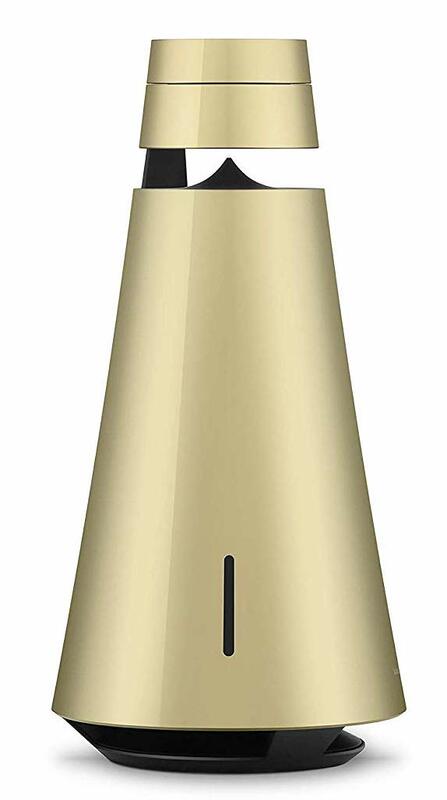 The Link 300 is also one of the few speakers on this list to offer Chromecast, Google's system for broadcasting audio and video between products. Although this is different to the Google Assistant, the integration is seamless, and that gives the Link 300 a unique place on this list. It definitely isn't as good a smart speaker as the HomePod or Google Home Max, both of which beat in terms of sound quality, but it certainly gets the job done. What We Like: Good overall audio performance, perhaps the best microphones of any smart speaker. What We Don't: Other speakers in this price range outperform it, screen feels clunky. 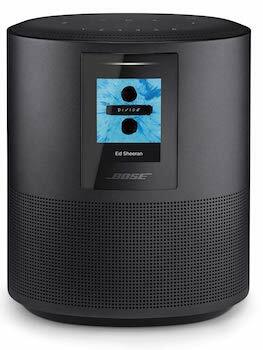 The Bose Home Speaker 500 definitely has a few problems that keep it out of the top ten. Perhaps the most obvious one is that it simply isn't as good as other, less expensive speakers. 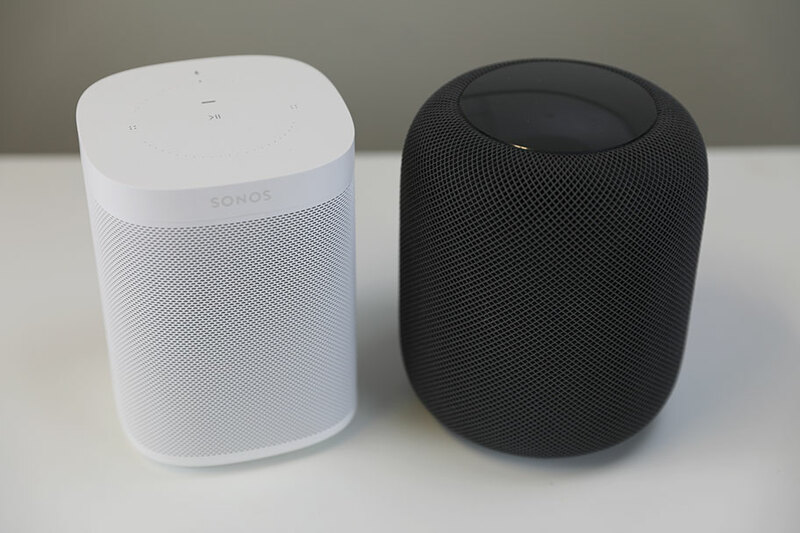 The $349 Apple HomePod beats it on sound quality, and the $199 Sonos One beats it on...well, everything, really. With a dated, somewhat pointless screen - it shows album info, and nothing more - and a somewhat boring design, this speaker definitely isn't running with the big dogs. But it's on this list for a reason. Two, actually. The first is that the overall audio performance is crisp and clear, easily the equal of speakers like the Sonos Beam. It also has a soundstage that is wide and engaging, which is impressive for a small speaker. The second reason is the quality of the built-in microphones. 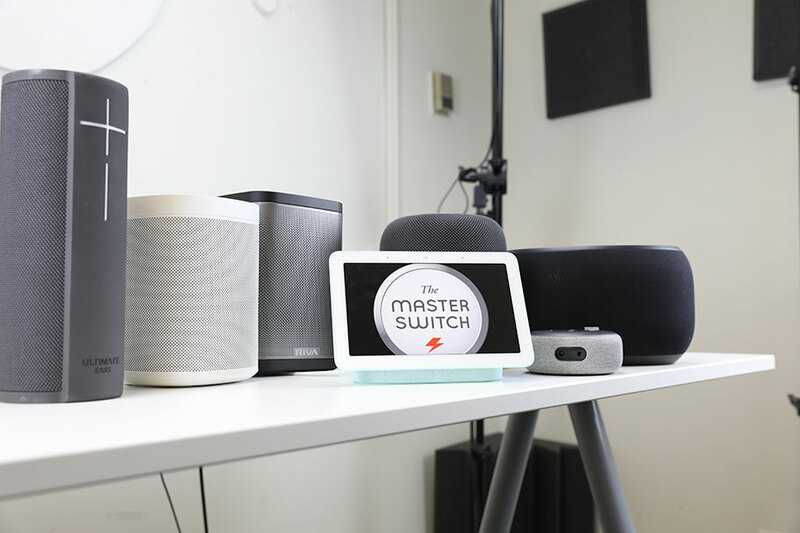 Out of all the speakers we've tested, the Home Speaker 500 is the most likely to detect your voice in a noisy environment - like a chaotic kitchen, or in the middle of a night while watching Netflix. If your home tends to be a bit noisier than others, the Home Speaker 500 may be the one for you. What We Like: Superb screen, simple operating system, drop-in functionality. What We Don't: Sound quality could be a lot better. 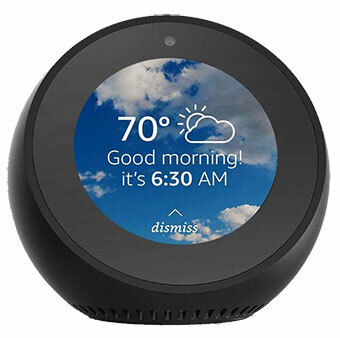 Here's the thing about the Echo Spot. 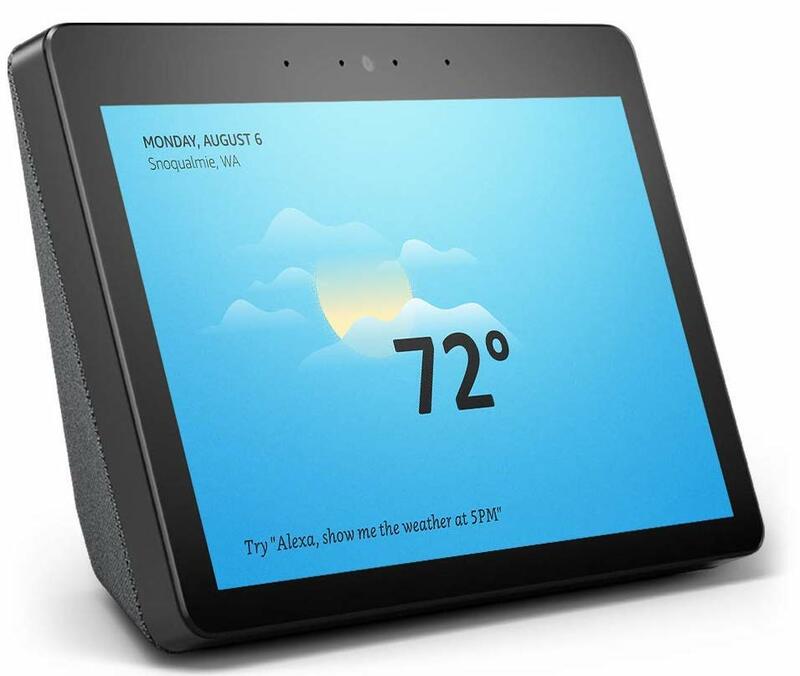 It's a little old now - Amazon recently released the second-generation Echo Show, which has a much larger, rectangular screen. But this smart speaker feels so well-designed and friendly that we just keep coming back to it. In our opinion, it's one of the best smart speakers with a screen available. It works so well, and so seamlessly, that you'll wonder how you managed without it. We have one permanently installed in the office, and we use it daily. What We Like: Good display, voice recognition is excellent. What We Don't: Video and voice calling have problems. Amazon has clearly made improvements to the original Echo Show. They've reworked the microphone array, meaning that it's easier for the Alexa assistant to hear what you're saying. 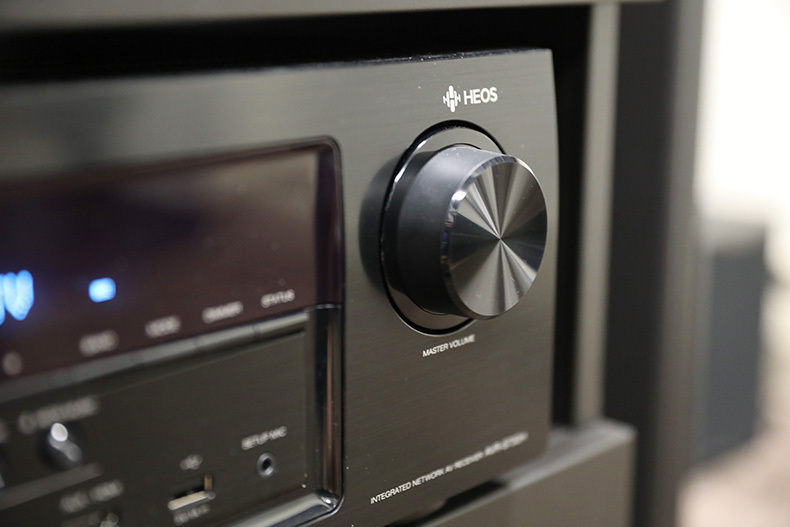 The sound is better, with Dolby processing for movies; you're not going to beat a home theater system, or even a soundbar like the $399 Sonos Beam, but the audio quality is alright. The 10.1" screen is also superb, and the fact that Alexa lets you access services like Hulu makes it great for watching series and movies. Even better: set it up in the kitchen while cooking, and use YouTube videos to help you along with the recipe. We still think the Echo Spot is a solid value over-all, but if you're looking for more screen real estate, the larger Echo Show is a better choice. However, we did find that the Show had issues with voice and video calling - the audio quality on felt dodgy, and video would occasionally glitch out. You might want to wait a little while before buying. Let them iron out the bugs. What We Like: Great assistant and easy to use. What We Don't: Not meant for music appreciation. The Google Home Mini is essentially a pint-sized version of the original Google Home, above. It was designed as an easy-to-use, smart assistant-friendly device that allows you to play music and access the wonders of voice commands. With the Google Assistant as our assistant of choice, we gravitate towards their lineup, including the impressive $399 Google Home Max. The functionality of the Google Assistant is far superior to others on this list, and we find that it suits our needs better than that of Amazon Alexa. While the Google Home Mini was an almost obvious choice for best budget speaker, it was sadly beaten by the $50 Echo Dot (3rd Gen) for sound quality reasons. 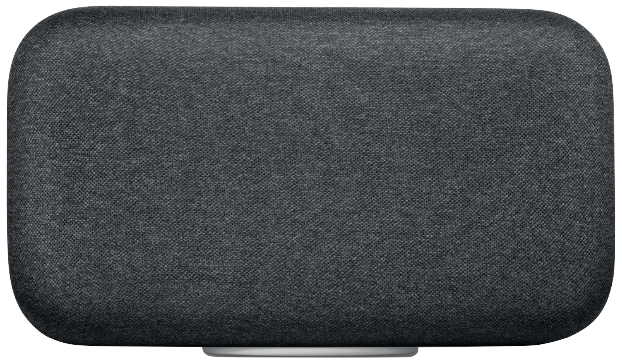 The only downside to the Google Home Mini is that this speaker isn't sound-focused - meaning you aren't going to use this to appreciate your music. You'll most likely be using it to handle smart assistant tasks, or to control a larger, better speaker. 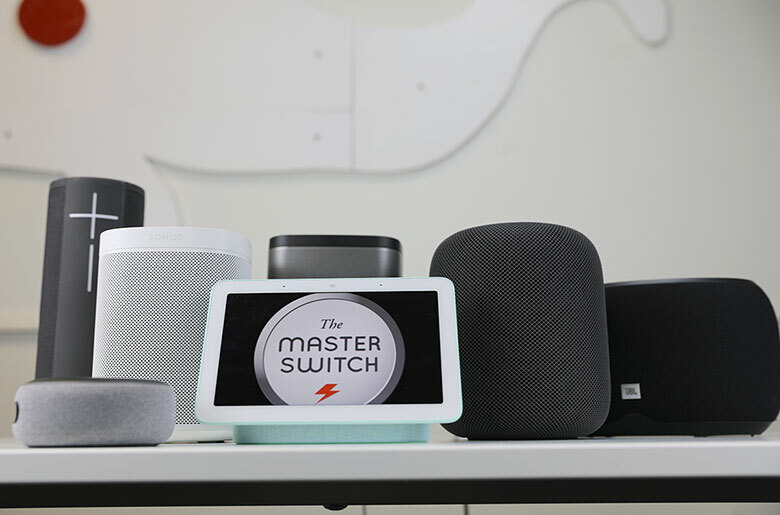 The Google Home Mini can be used to control Chromecast-enabled speakers, like the JBL Link 300 or similar, making it the ideal choice for someone looking for a voice command remote control for other devices. Additionally, you can use the Google Home Mini in your kitchen for cooking advice and recipes, and to make hands-free phone calls. At $49, it has incredible value. What We Like: Stripped-down version of the MEGABLAST that still offers a ton of features. What We Don't: Voice recognition isn't as immediate or as clear as other speakers. If you're looking for a portable smart speaker under $150, this is a clear choice. 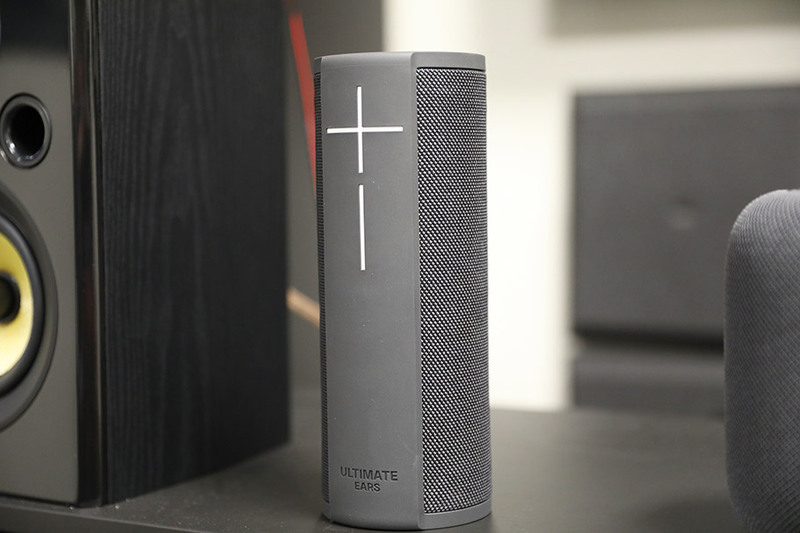 The Ultimate Ears BLAST is a slick little speaker that offers great features for the price. Its bigger brother, the $125 MEGABLAST is listed above as our pick for best portable smart speaker, and this is a close second. Ultimate Ears really dominate this particular category, handily beating out competitors like the $199 Riva Concert, below. It's beaten out by the MEGABLAST thanks to its reduced battery life - 11 hours versus 15. There's also slightly less volume, and the speaker does distort a little at high volumes, even if the overall sound quality is good. One issue we did have was that the speaker sometimes struggled to pick up our voice, especially if there was background noise of any kind. While it might not beat others in terms of sound quality, this is an excellent budget, portable smart speaker. What We Like: Superb display, logical operating system, camera cover. What We Don't: You can't use the screen vertically. You'd be forgiven for thinking that the myriad of smart speakers on the market all come from Amazon or Google or Apple. That's not the case. Lenovo is the latest company to give it a try, and they've done it in an interesting way. The Smart Display has a huge screen - the big, clear, sensibly-laid-out touch display is fantastic, and an absolute joy to use. The larger display makes it a much better option for instructional videos and screen functionality, and it performs surprisingly well in terms of sound quality. Don't expect it to beat the $349 HomePod, but its twin 10 watt drivers push out reasonable bass. Unfortunately, a couple of things let this smart speaker down. You have to use it in a horizontal orientation – the screen won't flip vertically. In addition, it's impossible to use streaming services like Netflix right now, but YouTube works just fine. If you're looking for a kitchen side-kick or YouTube streamer, this is the pick for you, but we'd recommend going for the Google Home Hub. It may be smaller, but we think it's quite a bit better. It's also $30 less expensive. What We Like: Detailed sound quality, ability to go portable when needed. What We Don't: Odd control choices, can't link with other speakers. 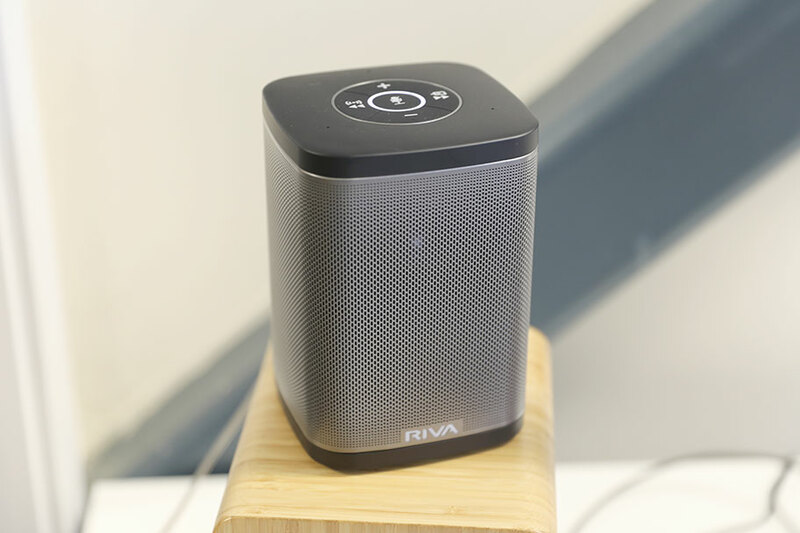 The RIVA Concert smart speaker has a few tricks up its sleeve. For one thing, it has an ability that no other speaker on this list has. 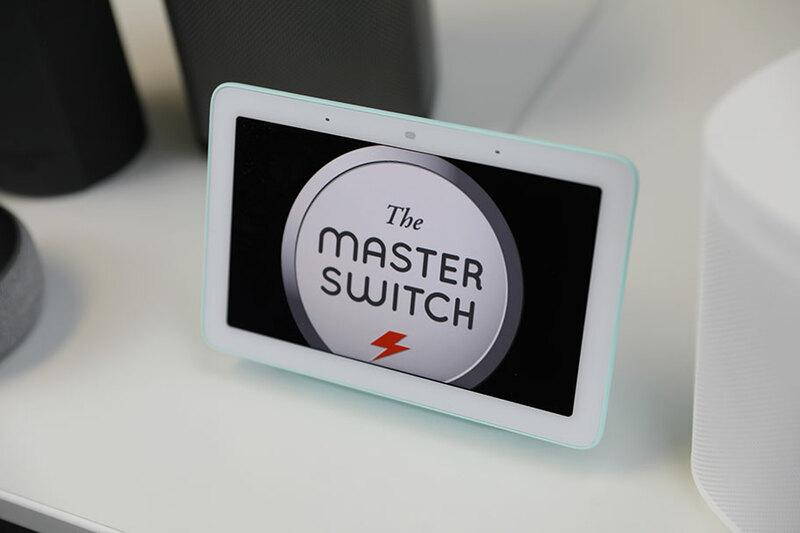 It can function as both a mains-powered wireless speaker, and as a portable one, with a 15 hour battery pack locked onto the bottom. That's not something the UE Megablast can boast, and it means this little speaker is surprisingly versatile (although you will need to pay an extra $49 for the battery pack). It matches this portability with a very decent sound quality, easily the equal of the Sonos One, which costs roughly the same amount. The problem is, a couple of strange design choices mean that the Sonos One is still much further up on this list than the RIVA Concert. We are not entirely sure why the Concert doesn't have a physical play/pause control – even if it's fully Alexa-compatible, the option still would have been nice. And unlike the Sonos speaker, you can't link the Concert to other RIVA speakers - a forthcoming update will fix this, but it's not available yet. In other words, this speaker has problems that companies like Sonos have already solved. If you want a speaker that works in both portable and static variations, it's perfect, but it definitely has its limitations. What We Like: Outrageous sound quality. What We Don't: Even more outrageous price tag. As a general rule, high-end audio manufacturers don't bother with smart speakers. Their target market are far more interested in air-motion transformers and new-old-stock tubes than asking their speakers what time it is in Tokyo. B&O are the exception to that rule. They've grafted Google Assistant onto the Beosound 1, and if you want truly good sound with a virtual assistant thrown in, this is the way to do it. It's one of the most bizarre and beautiful speakers we've ever come across, and we just had to include it here – even if almost nobody looking for a smart speaker is going to buy it. At the time of writing, it feels like every single company in the world is releasing a smart speaker, even companies that have never actually made speakers. It can be quite difficult to pick out the promising ones from the list of upcoming releases, but there are definitely a few we are excited about. One of them has actually been released already, but only in China. The Huawei AI Cube functions as both a 4G wireless router and an Amazon Alexa speaker, meaning that it offers something a little bit different to other smart speakers. No word on pricing or availability yet, but we'll test it as soon as we can. Another speaker we are excited about is the Tivoli Audio Music System Home. You could argue that this is an advanced tabletop radio – Tivoli, after all, are known for these. But it does double duty as an Alexa-powered smart speaker, too, and promises to do it while delivering scintillating sound quality. We can't wait to test this one – we think it's going to give the Apple HomePod serious run for its money. Picking the right smart speaker is all about asking yourself the question: what do you want it to do? It's easy to like the idea of having an intelligent little assistant on your desk, able to help you be more efficient and productive – or to sing you stupid songs when you're having a bad day. But unless you have some idea of what you want to get out of the experience, you'll quickly find that your virtual assistant becomes a nuisance – something you barely use. In that case, you may as well have bought a wireless speaker, and saved yourself some money. The first thing you need to do is actually pick a virtual assistant. There are several to choose from, and we go in depth on what each of them offer in the section below. To make this choice, you need to think about the tasks you most commonly need done. Do you need to play music on Spotify? Add things to a shopping list? Set timers for cooking? Different assistants will have different strengths, and some will be able to do things that others cannot. For example, if you buy our top speaker, the Apple HomePod (full review here), you'll be able to listen to music, but you'll only be able to control Apple Music with your voice. Spotify, Tidal and the like will need to be controlled via an app. Our list of speakers, above, clearly states which assistants come bundled with which speaker, and that will help you narrow it down. It's also worth thinking about what you want out of the speaker itself. How invested are you in sound quality? Most smart speaker manufacturers don't actually put a huge emphasis on this – Apple is one of the few exceptions. If you have existing speakers already, or are more interested in the virtual assistant then you are in the sound quality, and it may be worth going for something smaller. This also has the benefit of costing less money. For managing a calendar, or helping out with cooking, there are few simpler or more affordable options than the Amazon Echo Dot (3rd Gen). Whichever one you pick, take your time. A virtual assistant should integrate seamlessly into your life, and be a help, not a hindrance. A virtual assistant is the reason you buy a smart speaker. It allows you to do a staggering number of things, from playing music to setting timers to controlling the lighting in your house. Virtual assistants – sometimes called smart assistants – are tremendously versatile, and they all have their own positives and negatives. There are three main ones we are going to talk about here - Alexa, Siri, and Google Assistant. While there are others, like Samsung Bixby and Microsoft Cortana, they are not as widely available, and definitely not as good. For the time being, the following assistants are the ones you need to be looking at. Amazon's virtual assistant is by far the most common, appearing on 10 of the 18 speakers on our list. It's definitely not the smartest one out there. We have several Alexa devices, both at home and in our office, and while the assistant does a good job for the most part, we found ourselves continually running into problems. The biggest issue we had was with smartphone integration, where Amazon Echo devices repeatedly refused to recognize our SmartThings switches and bulbs – even though the Alexa app (iOS/Android) worked just fine. We also found it easy to trip Alexa up, and it had real problems with follow-up questions. Alexa does have several advantages over something like Siri, however. It has the ability to recognize different voices, and you can use voice commands to play third-party music services like Spotify. Assuming your speaker is compatible, you can also make calls – although you can only receive calls from other Echo speakers and someone using the Echo app on a smartphone. You can also add third-party 'skills' to Alexa via the app, which means that the assistant is continually evolving, and continually getting more useful. Unlike Apple, Amazon is quite happy playing nice with other manufacturers – they not only make several speakers of their own, but also let companies like Polk and Bose use their assistant. The best Alexa speaker, in our opinion, is the Amazon Echo Dot (3rd Gen) (full review here). It also happens to be extremely easy on the wallet, costing only $50. Like Amazon Alexa, Google Assistant has voice training, allowing it to separate your voice from others. You can control Spotify, Tidal and the like with voice commands. You can also make calls – although as of yet, you cannot receive them, something which Alexa can do given the right circumstances. Alexa is more versatile, with its growing library of skills, but it hasn't managed to catch up to Google Assistant in terms of smarts. If the AI revolution ever happens, Google Assistant will be leading the charge. If you're an iPhone user, you'll already be familiar with Siri - we won't call it Apple Siri, as that just sounds odd. Apple's virtual assistant is a little more versatile and intelligent than Amazon Alexa, but doesn't quite measure up to the standards of Google Assistant. It does have a few distinct advantages: integrating with a smart home is easy - thanks to Apple's closed HomeKit ecosystem - and a recent update allows you to make and receive calls, which is fantastic. Unfortunately, there are some major downsides. Chief among these is that voice commands will only work for Apple Music. You can still listen to things like Spotify and Tidal, but you'll have to control them manually using your smartphone. You won't find Siri on any other smart speaker except for the top-ranked Apple HomePod, which costs $349. It is by far and away the best smart speaker available for music, with terrific sound quality. However, it does require you be happy using Siri, and those without an iPhone won't be able to use it. What can smart speakers actually do? It's not a stupid or frivolous question – before you actually buy a smart speaker, it's worth having a good understanding of what it can and can't pull off. In the section above, we went in-depth into what each virtual assistant is good at, but there are some functions that are common to all smart speakers. Most services smart speakers are commonly used for, like playing music, require linking accounts. A speaker should be able to play music via a streaming service - be that Spotify, Tidal, Apple Music, whatever – and it will be able to do so after telling your assistant of choice to play music via that particular speaker. Instructions for this vary, but it's usually done via each service's app. You should, in theory, be able to control any app or smart connected device (like Philips Hue bulb) with your voice, simply by saying "Turn on the lights in the living room", or "Add dog food to my shopping list." most virtual assistants require you to say a trigger word first - "Alexa" for Amazon Alexa, or "Hey Google" for Google Assistant. You'll quickly discover some requests that just stump your smart speaker, but it's usually easy to figure out what questions are likely to get you a useful response. Smart speakers rely on a wireless network to work. They have to be connected to the Internet, because each request is sent to a server somewhere to calculate and deliver a response. However, you might have noticed that a couple of speakers on our list are portable. The best of these is the $193 Ultimate Ears MEGABLAST, which packs in Amazon Alexa. It's waterproof - rated IP67, which means you can dunk it in three feet of water for half an hour. And with 15 hours of battery life, it's quite comfortable being taken on long trips. As you can imagine, there is no Internet or Wi-Fi signal readily available on some of these trips…and yet Alexa will still work. What gives? The answer is, it won't – unless you enable your smartphone's portable hotspot. In doing so, you'll be able to give your speaker a data connection, which means it will be able to work as normal. It will probably be a little slower to respond, as smartphone data isn't as reliable as a Wi-Fi connection, but there's no reason you shouldn't be able to use your smart speaker in the park, or at the beach. Handily, you also don't need to worry about other people accidentally activating your assistant. Both Alexa and Google Assistant have the ability to recognize different voices, meaning they can prioritize yours. Siri doesn't, but given that the only speaker that currently offers it - the Apple HomePod - isn't portable, it's much less of an issue. One of the strangest things about smart speakers is that the companies who make them don't always place a huge emphasis on sound quality. Sure, they may proudly talk about their speaker drivers and thumping bass in their marketing copy, but let's be honest: if you think the $100 Amazon Echo Spot is going to have decent sound quality, you deserve to have your head examined. This is because the main selling point of smart speakers – that they are smart, and contain virtual assistants – does not require amazing sound quality. It's still out there if you want it – our best overall smart speaker, the $349 Apple HomePod (full review here), sounds fantastic. But in all cases, you should expect your smart speaker to not sound quite as good as, for example, a regular pair of bookshelf speakers. The good news is, most smart speakers are equipped with Bluetooth – we've indicated in our picks above where this isn't the case. That means you can quite happily connect them to a more powerful speaker, and get the benefit of both a virtual assistant, and excellent sound quality. If a smart speaker can be used to play music, then what about using it to control your TV? Or your surround sound home theater setup? The answer is yes: it's totally possible. It's not always as intuitive or straightforward as it could be, especially if you're trying to link a stand-alone smart speaker with, say, a soundbar. But there are several ways to pull it off, and it can make watching movies and series a total dream. Several existing TVs and A/V receivers actually come with smart assistants built right in. The Denon AVRS-740H, for example, which is the receiver we currently have in our testing room, is fully compatible with Amazon Alexa. And several TVs now on the market have an assistant built right in, too. That means it's entirely possible to tell your TV to search for Brooklyn 99 on Netflix, or to find a new season of The Good Place. No additional equipment required. In our opinion, that's actually the easiest way to control your movies and TV with a smart assistant, rather than trying to rig up a system with an Amazon Alexa speaker. There are also several soundbars that have an assistant built in. 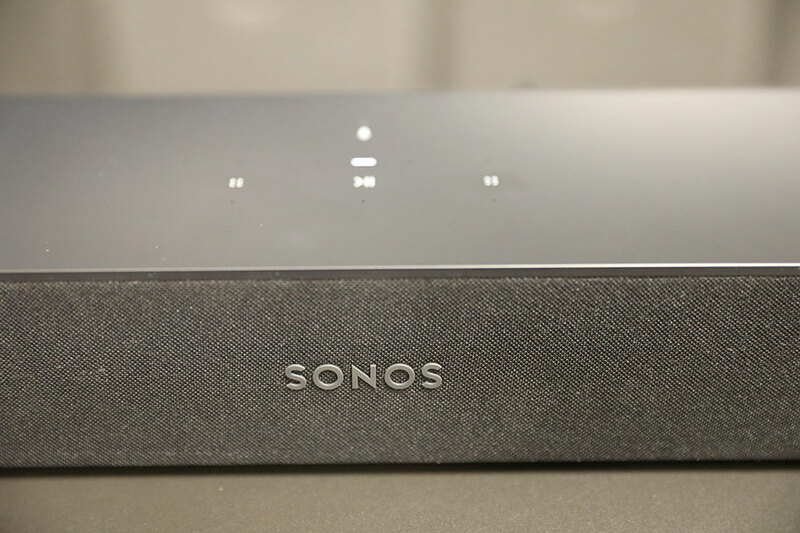 We have a couple of them on our list – the best, by far, is the $399 Sonos Beam (full review here). It boasts Amazon Alexa functionality, allowing you full control of what you see and hear. A soundbar is an excellent alternative to a full home theater setup. The best ones even come with additional speakers and a subwoofer, meaning you can get a decent surround system for very little outlay. 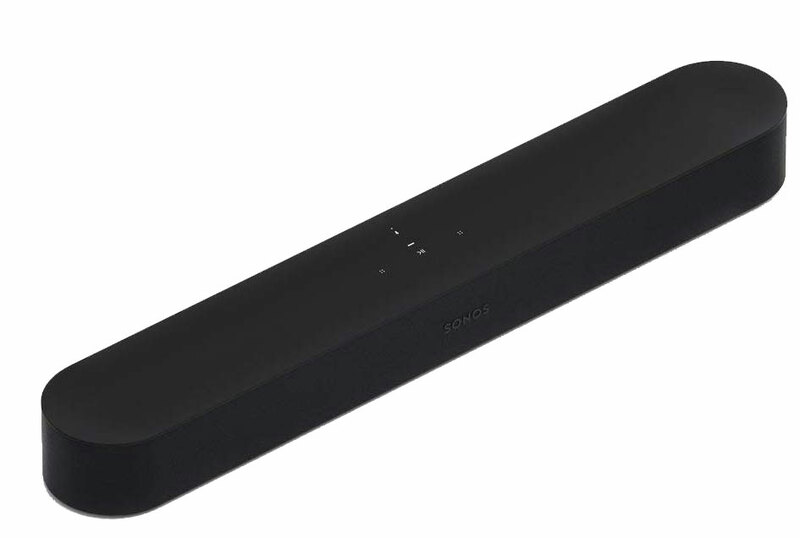 Sonos and Polk currently offer smart soundbars, and Bose has a few in the works, too. As mentioned before, buying one of these is easier than rigging up your existing smart speaker to try and control your TV sound - trust us on that. Smart speakers fulfilled a dream we've had since we first started paying rent on an apartment: the ability to shut off every single light in the place with a single command. It sounds petty, until you actually do it. Not having to go around and switch off every single light, or experience the sinking feeling when you come home and realize you've left them all on, is a total joy. Smart speakers can also do so much more than that. Assuming you have the requisite smart devices, you can control your home's temperature, adjust the color of the lights, control your security cameras, locks, doorbell, and so much more. That's the theory. In practice, it can be a little bit complicated – and we've had plenty of incidents where our smart speakers simply didn't do what we wanted them to. This is because smart devices – sometimes called the Internet of Things - are made by multiple different companies. Getting a Nest thermostat, a Philips Hue bulb, or a TP-Link outlet to talk to Alexa, Google, and Siri can be tricky. The procedures for actually setting all this up vary from company to company – we aren't going to go into them here. Our recommendation, however, is that if this is your primary consideration, you may want to think about getting several smart speakers to dot around your home. That way, you'll always be able to issue commands, no matter what room you're in. Try the ultra-cheap Amazon Echo Dot (3rd Gen), which cost $50 each. It would be absolutely fantastic if smart assistants could make phone calls for us on command. The reality is that calling using a smart speaker is surprisingly complicated. No matter which assistant you use, there are several limitations you'll have to take into account. We went into detail about these in the section on the three most popular assistants, above, but let's go over that briefly here. Siri will let you make and receive calls without any restrictions. Amazon Alexa will let you make calls on certain speakers, but you can only receive calls from someone with an Alexa-equipped speaker of their own, or with the Alexa app. Google Assistant allows you to make calls, but not receive them. Bottom line: Right now, making phone calls with a smart speaker is kind of sketchy. In almost all cases, it's easier and quicker just to use your phone. However, there are some things that smart speakers can do that a phone can't. 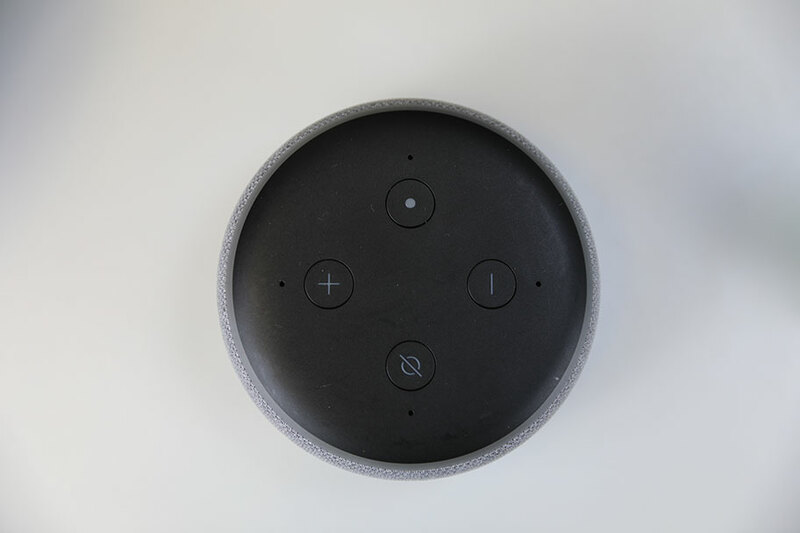 Amazon's smart speakers with screens, for example, have a Drop In feature, where authorized users can connect to your speaker and chat to you. It sounds a little creepy, but in certain circumstances, it's ideal. If you have a pet you want to say hi to during the day, or an elderly relative to check on, this could be the perfect solution. You'll find this option in smart speakers like the $230 Amazon Echo Show (2nd Gen). We're going to put forward a controversial opinion. We think that screens on smart speakers are far less important than manufacturers would like you to believe. The reasoning for this is simple: the primary reason to buy a smart speaker is for the smart assistant, and the primary means of interacting with a smart assistant is by voice. If all you want to do is tap at a screen, then you may as well buy a tablet, like an iPad. However, we do think that there are a certain few folk who can benefit from a larger screen - for example, elderly relatives, children, or anyone looking for a kitchen side-kick. While our usual arguments stand on the side of sound quality, we understand that smart speakers with screens are intended for much more than listening to music. This is why we've replaced the cheaper Amazon Echo Spot with the more capable Google Home Hub at the top of our list. 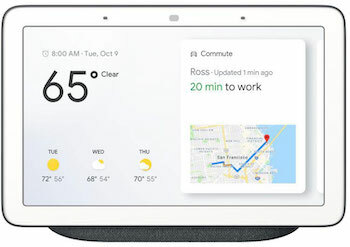 If you are buying a smart speaker with a screen for the functionality of the screen alone, the Google Home Hub or the Amazon Echo Show (2nd Gen) will do you just fine. But, if you're looking for a smart speaker with a screen and the ability to control larger, better sounding speakers, we suggest the Amazon Echo Spot. 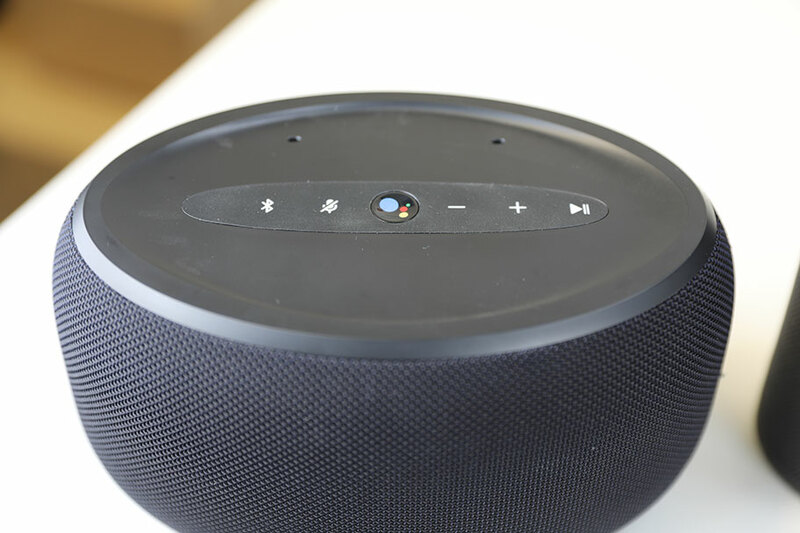 The problem with many screen-based smart speakers is that the audio quality is often neglected - so, you may be forced to try the latter option if you plan on listening to music often. We'll leave you to decide which option suits you best. Smart speakers might be primarily focussed on the inclusion of voice assistants, but they are still meant for listening to music. That means you need a way to get music from a source, like your phone, to the speaker itself. There are a couple of ways of doing so - the most popular transmission protocols are Apple's AirPlay 2, Google's Chromecast, and Sonos. We have a full, highly-detailed breakdown of the differences between these three systems here. In short: AirPlay 2 is a way of sending audio from an Apple device to a compatible speaker; Chromecast does the same thing without discriminating operating systems; and Sonos relies on a bespoke app that lets you access streaming services directly, and will work on any device. By streaming services, we mean apps like Spotify. A quick note on Bluetooth: Bluetooth essentially bypasses systems like AirPlay 2, Chromecast, and Sonos. It's a way of letting two devices communicate, and once paired, you can send audio from one to the other quite easily without relying on a third-party protocol. The above services depend on Wi-Fi, and you will need your speaker and your source to be on the same wireless network for them to work. Below, we've listed the transmission protocols available on each of the wireless speakers in our list, as well as some of the services you can access directly. We've tried to be as thorough as possible, but there are dozens of compatible services. Please forgive us if we've missed any. This is a big one. For a smart assistant to be effective, it has to be listening. That means that, at any given moment, it is connected to the servers at Google or Amazon or Apple – and it is continually exchanging information with these servers. Understandably, that's caused some concerns about data, and just how much these companies know about you. But are these concerns justified, and if you aren't comfortable with the release of this data, what can you do about it? The good news: despite what conspiracy theorists would have you believe, it's unlikely that your speaker is spying on you. Speakers and their smart assistants do not activate unless you use the wake word - "Alexa", or "Hey, Google" or "Hey, Siri". Those words tell the speaker to start recording, which allows it to talk to a remote server, and deliver an answer. Every speaker on the market also comes with the ability to deactivate the microphone with the touch of a button, meaning you can cut off the assistant entirely if you like. The problem is, every use of a smart assistant gives the company data – data that you consent to give it when you agree to the terms and conditions. If you actually have the stamina to delve into these massive documents, you'll find that they use this data to build a picture of you, and sell it to advertisers. We'll be honest: smart speaker companies have a pretty spotty track record when it comes to what they do with your data. A far bigger concern is that you will have installed a device in your house with a camera and microphone, connected to the Internet. If you ever have the misfortune to be targeted by a hacker, they could very easily gain access to your smart speaker, turning it on without your knowledge. Very obviously, the companies who make these speakers don't want this to happen, so they spend quite a bit of time on their security protocols. But these aren't infallible, and it means that you need to be quite careful where you actually place your smart speakers.